20 electeds want to outright ban tourist helicopters. Mayor de Blasio’s EDC opposes them. This post has been read 3035 times! Not reported whatsoever in the press was a City Council meeting of 20 elected federal, state, and city officials, who all want to completely ban tourists helicopters over the city. However, Mayor de Blasio’s EDC, still run by Mayor Bloomberg’s old EDC leader, Kyle Kimball, stubbornly supports the helicopters. Of note, Kyle Kimball, is also the main reason that Gale Brewer and the other electeds trying to oppose the Seaport tower will likely lose. As we reported previously, at the end of the day, the Mayor (i.e. the EDC) will have the final say. A diverse group of nearly 20 elected officials from across New York City met with Mayor de Blasio’s staff at City Hall on June 6 to lay out our and our constituents’ belief that “helicopter tourism” should be banned by the City. Present at the meeting, in addition to myself and the Mayor’s staff, were Congresswoman Nydia M. Velazquez, who represents Brooklyn, Lower Manhattan and Queens; Congressman Jerrold Nadler, who represents parts of Manhattan and Brooklyn; State Senator Daniel L. Squadron, who represents Lower Manhattan and Brooklyn; Assembly Member Felix Ortiz of Brooklyn; Assembly Member Linda B. Rosenthal of Manhattan; Manhattan Borough President Gale A. Brewer; and City Council Member Mark Levine of Northern Manhattan, plus staff members representing other elected officials who could not attend the meeting. These officials, who agree that the City should no longer allow tourists helicopter service flights that disrupt the quality of life in our neighborhoods and present a danger to the neighborhoods they are flying over, met with the Mayor’s staff to plead our case. In recent years, since the practice began, many residents of Northern Manhattan have voiced their opposition to the noise created by helicopters hovering over their homes. Over Northern Manhattan, helicopter flights use the Hudson River as a highway, then cut across Washington Heights to view Yankee Stadium from the air. One helicopter in particular tends to hover in place for extended periods of time, apparently acting as a traffic cop for other flights. As the meeting ended, Mayor de Blasio’s staff promised a follow-up meeting after the complaints passed along by the group of officials were checked and verified. From our point of view, the issue has been well-studied and analyzed, and the City would be justified in ending the flights. This entry was posted in - City government, - Downtown oversight, - Federal government, - State Government, Helicopter noise. Bookmark the permalink. 4 Responses to 20 electeds want to outright ban tourist helicopters. Mayor de Blasio’s EDC opposes them. As with so many other local stories of late, Battery Park TV is leading and the mainstream media (at most) is only belatedly copying. 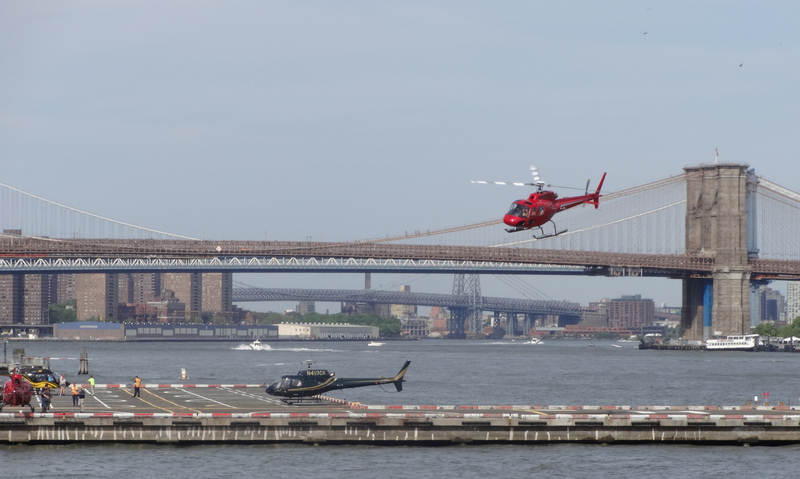 Thank you, BatteryPark.TV, for this update on banning the unrelenting tourist helicopter traffic on the Hudson River waterfront that is destroying the quality of life and real estate in New York and New Jersey. A no-brainer DeBlasio, FAA, and EPA issue that will eventually be addressed due to the unavoidable rise in collisions and accidents. Children and anyone else using the parks and their homes as a needed refuge should find a way to leave their neighborhoods for daylight hours especially during warm weather. Flee to the East Side, Ulster County or the Hamptons like others with real influence because most of the residents on the waterfront and near Yankee Stadium clearly do not matter to the Mayor and the mainstream press. It’s strange that, with so many politicos and constituents in favor of canceling the heliport operations, there’s been so little reporting on it. Brooklyn Heights sees and hears the chopper traffic, too. The Promenade, parks, residential buildings and streets are all negatively affected. There is an online petition. Enter ‘change.org stop helicopters NY NJ’ in your browser and it should come up. The tourist helicopters need to be banned once and for all. They are nothing but a constant nuisance to listen to all day every day for the rest of our lives. Any waterfront park we have is bombarded with the constant flow of tourist helicopters, one after the other, all day long, non stop. The droaning is ruining the quality of our lives. We as residents should come first and foremost, NOT tourist helicopters. We have many other ways to view the city without ruining the quality of life for the thousands of tax payers that live or work near the waterfront, and the residents that would like to enjoy the peace and tranquility of the parks waterfront. Hopefully after all these years this constant noise can finally stop.